What is wrong with KFC Streetwise Cheese Top Burger? 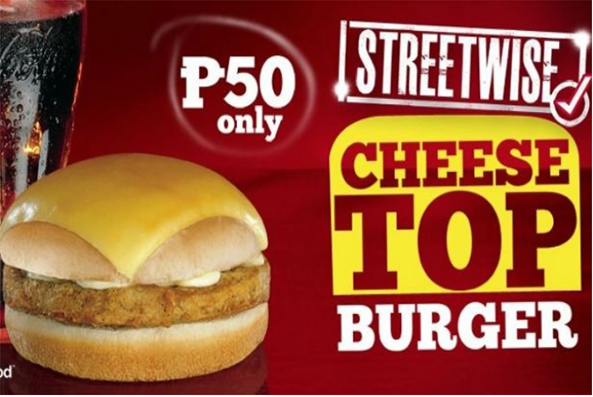 Recently, KFC launched their latest addition on Streetwise Meals- it's a Chicken Burger with a cut of Cheese on top. Really unbelievable as tv ad says but it's true. The burger with cheese on top became a viral topic worldwide today. However, the new food attraction at KFC seems to be a marketing strategy. Doing crazy thing, not common and out of the box idea into reality. It is just like a superhero having undies outside and yet the whole world accept it. It just created a noise not only in the online world but also in another countries which thought the burger is very fancy and the fast-food restaurant is very strange. Jimmy Kimmel on his show Jimmy Kimmel Live! featured the new product from KFC. The show is an American longest -running late-night talk show and being broadcasted on ABC. The purpose of the feature is to state the difference of KFC in America to the Philippines and the negative impact of the new offering. Here is the KFC OMG Feature from Jimmy Kimmel Live! According to KFC, the concoction is “the first and only cheese-topped bun burger with KFC’s signature Original Recipe chicken patty with rich Garlic Parmesan dressing.” Actually, we're sure on their claim “first and only cheese-topped bun burger.”. It is only a result of imagination on how they are going to incorporate their slogan, "Finger Lickin' Good". The KFC Cheese Top Burger also trends on Twitter worldwide , June 30. From many of the posts, it is clear that review is negative after watching Jimmy Kimmel's created KFC OMG commercial. However, from some persons who already tried the burger, there's no problem with that idea. "The KFC Cheese Top Burger is trending worldwide! Try it to find out what the buzz is all about. Share your experience using #KFCcheesetop! ", @KFCPhilippines said on their Twitter account. The Philippines once again proves that it is the Social Media Capital of the World. During the first ever netizens' meet-up in Makati, 4-7 pm, around 500 netizens registered for the said event.Organizer only expect around 300 participants. The gathering of bloggers, Twitterati and Facebook users is successful having fun-filled games, surprises and guest-speakers who inspire netizens in using social media platforms. 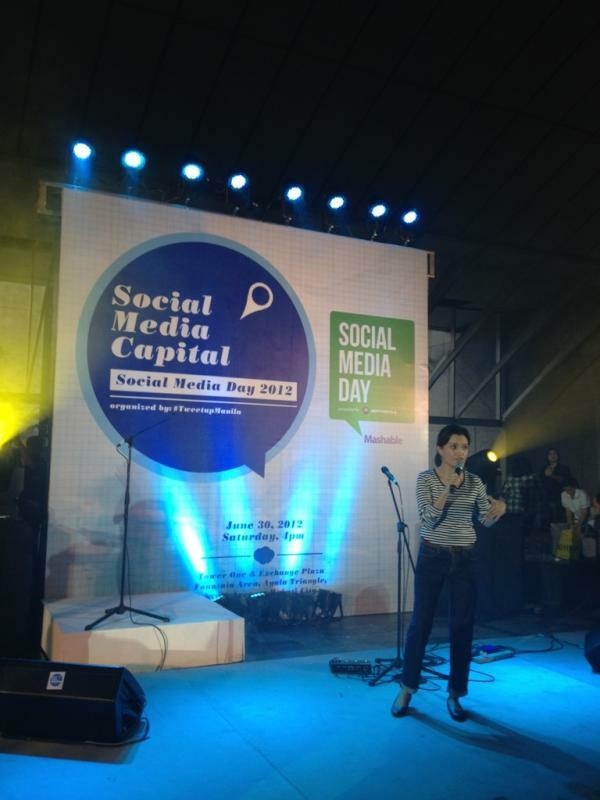 Daphne Osena Paez,one of the guest speakers during meet-up shared the story of how Canada got help for Sendong victims. It is really inspiring that thru hashtags on Twitter, she called attention of Global Medic in Canada. "Thanks ‪#SocialMediaCapital‬ event for giving me chance to tell the story of how Canada's Global Medic got to help ‪#washi‬ victims. " , Daphne said on her Twitter account. "Use social media to spread good over bad. ", she added. 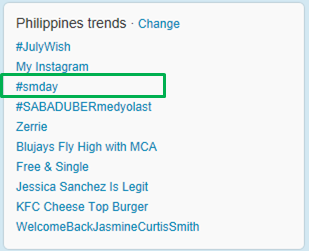 As expected, the worldwide event with promoted hashtag #smday trends on Twitter. At the end of the event, major sponsors like Globe Telecom, Smart Communications and Lazada.ph gave raffle prizes for those who followed their Twitter account. Prizes includes 2- pair of tickets for Nicki Minaj concert, Samsung Galaxy Nexus and iPad respectively. We're thrilled to celebrate Mashable's third annual Social Media Day! We launched the event in 2010 as a way to recognize the digital revolution happening right before our eyes. We invite you to join fellow social media enthusiasts by hosting or attending a Social Media Day Meetup in your area. Visit our Social Media Day website for resources and more information: http://mashable.com/smday We look forward to celebrating with you! Filipino Twitterati, bloggers, advocates, practitioners from media, business, government are expected to grace that day's celebration of creativity, community and conversation that has pushed individuals, companies and organizations, and the nation many steps forward and ahead of the rest of the world. In the Philippines, Social Media Day gathering will be done in Makati area and in other parts of the country like Quezon City, Iligan City, Cagayan de Oro City and Davao City. This is a major gathering of the Twitterati,bloggers and Internet users. 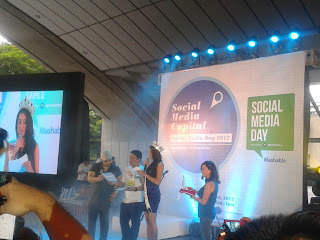 This year's theme will proclaim the Philippines as Social Media Capital of the World. According to study, 35million Filipinos have access to the internet that's why Philippines deserves for the title. 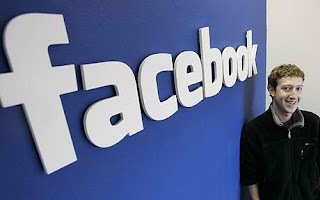 Over 27M Pinoys log-in to Facebook while some millions have Twitter account. Since 2008, the Philippines is tagged as Social Media Capital. The event is organized by TweetUp Manila and to be held at Tower One Fountain Area, Ayala Triangle, Ayala Avenue, Makati City. The admission is FREE. The event will serve also the launching of Project 140 to support 140 scholars around the country through the cooperation of social media users. The Makati event is presented by Ayala Land Inc., Make It Makati, TV5, Beyond the Box, Crumpler, NetBooster Asia, eLearning Edge, Unilab, EchoStore, Michelis, Axe, Garnier, Boracay, Adobo Magazine and KLM. We could expect the hashtags #smday or #SocialMediaDay trend tomorrow. Mashable MeetUps is now in 516 cities according to the popular website. 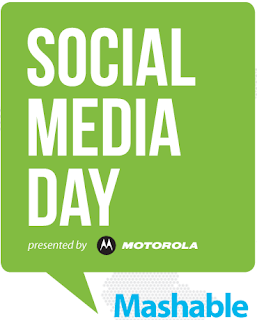 Social Media day is powered by Motorola. The Summit Express is proud to be part of this celebration! Share and proceed with the Meet Up tomorrorow. PRC announced the highest 10 places for June 2012 Social Worker Licensure Examination. NORHAINAH CALANDADA ABDUL AZIZ of Mindanao State University - Marawi City topped the board exam with 88.10% average rating. It was followed by MA ELINORE BUGAYONG VILAR of UP Diliman with 86.80% grade. Meanwhile, it was Bicol University-Legazpi that top on the list of schools with 100% passing rate (57/57). Mindanao State University-Marawi City is next with 94.05% passing (79/84). The Professional Regulation Commission (PRC) announces that 893 out of 1,429 (62.49%) passed the Social Worker Licensure Examination given by the Board for Social Workers in the cities of Manila, Baguio, Cagayan de Oro, Cebu, Davao, Iloilo, Legazpi and Zamboanga this June 2012. Click HERE for the TOP 10 Places and Performance of Schools. MANILA, Philippines - Men's magazine FHM announced on Thursday the voted 'sexiest Filipina' for the annual FHM 100 Sexiest in the World. Sam Pinto won the coveted title after garnering 1,249,189 votes against the second sexiest Angel Locsin who got 1,131,505 votes. Sam Pinto is the third woman to earn two-time title after Katrina Halili and Angel Locsin and second in terms of winning on consecutive years. In the partial results of May, Angel Locsin led the poll. Many expect that she is a sure winner for the feat. The poll is a combinations of online, text, and print ballots votes. FHM said that a total of 17 million votes were garnered at the said poll. Solenn Heussaff, Cristine Reyes and Marian Rivera landed on third, fourth, and fifth spots, respectively. To know more of the complete list of 100 sexiest in the land, grab a copy of July 2012 FHM magazine. It is now available in news stands, bookstores, and supermarkets nationwide for P150. Samuelle Lynne Acosta "Sam" Pinto started her career as commercial model. At the age of 10, she appeared on various commercials. She rose to fame when she joined Pinoy Big Brother Double Up Edition in 2012. She is also a endorser of Smart for their Netphone 701 release and various promos. Just recently, Smart Communications, Inc. (Smart) and PLDT launched the re-branding of it's Broadband services like Canopy and WIMAX popularly known as Bro to myBro. This move is after the success of PLDT myDSL which is now in-demand service in the market of communications. PLDT myDSL became hot topic in Twitter early this month (June 6-8) for it's interesting promos. 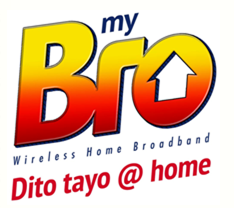 myBro will now serve as sibling of PLDT myDSL. It caters to the main stream market positioned for families (parents & kids) looking for a reliable unlimited internet for the home. Based on culture, re-branding information is done via ATL and BTL. "In a nutshell, while ATL communications use media that are broadcast and published to mass audiences, BTL communications use media that are more niche focused". Subscribers were mailed regarding the change. Enhancements of billing statements are some of the major moves. Get unlimited broadband internet for as low as Php26 a day. No need to go to an internet cafe just to access the internet. Now you can surf, chat, do school work all from home. Go to any SMART Store, accredited PLDT Home Reseller or call *1888 from your SMART cellphone now. You may also log-in to http://www.pldthome.com/ for more details. Watch myBro TV Commercial here. Smart is definitely the wireless leader in the Philippines in terms of broadband. Smart is the trendsetter among others for the improvement of customer experience. There are more reasons to LIVE MORE from Smart. Stay tuned for the updates and promos. The Professional Regulation Commission (PRC) announced that 65 out of 107 or 61% passed the Environmental Planner Licensure Examination given by the Board of Environmental Planning in Manila this June 2012. Results were released within two days after the last day of board exam. 1. Registration for the issuance of Professional Identification Card (ID) and Certificate of Registration will start on July 9, 2012 but not later than July 11, 2012. 2.Those who will register are required to bring the following: duly accomplished Oath Form or Panunumpa ng Propesyonal, current Community Tax Certificate (cedula), 2 pieces passport size picture (colored with white background and complete nametag), 1 piece 1” x 1” picture (colored with white background and complete nametag), 2 sets of metered documentary stamps and 1 short brown envelope with name and profession and to pay the Initial Registration Fee of P600 and Annual Registration Fee of P450 for 2012-2015. WITH 50 OR MORE EXAMINEES AND AT LEAST 80% PASSING PERCENTAGE- None of the schools is qualified! 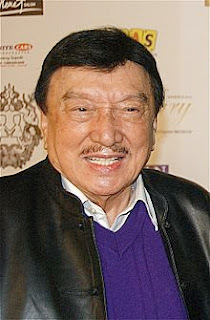 In a poll conducted by Yahoo News, almost 80% believe that Dolphy deserves to be called a National Artist by his unparalleled contribution in the entertainment industry. However, as Lacierda said, it's not the proper time for that recognition since a TRO was filed preventing Malacanang from conferring the Order of National Artists award. A due process should be followed in the selection of National Artist. It is proper that Cultural Center of the Philippines (CCP) and the National Commission on Cultural and the Arts (NCCA) select the next awardee to prevent any issues. “We recognize the process and it is a very rigid process. There are several tiers in nominating a national artist. We would like to respect the process. So we will leave it with both the NCCA and the CCP because these are the two joint boards who will nominate the national artist,” said Lacierda. President Noynoy Aquino meanwhile, awarded the veteran actor the Grand Collar of the Order of the Golden Heart for his iconic contribution in the entertainment industry. The Comedy King recently face a major challenge as he remains under observation at Makati Medical Center due to chronic obstructive pulmonary disease (pneumonia) and weak kidney. The entire Philippines is in support for Dolphy (Rodolfo Vera Quizon Sr. in real life). In Twitter Philippines over the week, the hashtags #PrayforDolphy and "Dolphy" became trending topics. Unlike on the first few days after he rushed to the hospital last June 9, major hoax on twitter says the comedy King is dead. As I've noticed also if I'am going to type Dolphy in Yahoo search , you may see related suggestions such as Dolphy died, Dolphy death, Dolphy dies and the so on- and that is a major disaster in the online world! For now, let's think of good vibes for the Comedy icon! X-Factor Philippines had just started with a big bang specially for the netizens. The British-born and Simon Cowell's created television music competition creates online buzz at its first airing day. Viewers of XFP react to Charice Pempengco's attitude during the show. Manu said that Charice became over- acting (OA) on her judging and they are not happy having Charice on the judges list.The hashtag #xfactorphilippines became a worldwide and local trend. From my point of view, this show is very promising but they should keep how the original X-factor should be. Contestants should really have the amazing talent or the blood of wow-factor. Judges should act as good and normal so as not to be called OA. It's really X-Factor Day as Twitter trends were filled with topics about the popular boy group today, the One Direction. One Direction is a product of UK X-Factor. 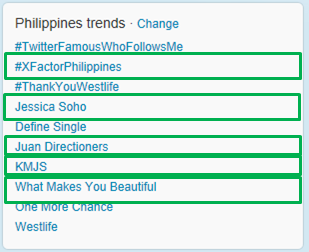 Jessica Soho on her top-rating show "Kapuso Mo Jessica Soho" featured the famous 1D band. In the Philippines, official club was created - the Juan Directioners or 1DPH. Room Assignment for June 2012 Nursing Board Exam has just been released by the Professional Regulations Commission (PRC). Venue of the examinations are Manila, Cebu, Pagadian, Tacloban, Tuguegarao,CDO, Legaspi, Pampanga, Zamboanga, Iloilo and other regional offices. View the list of Room Assignment HERE. For Manila, please proceed at the bottom page for the embedded document. 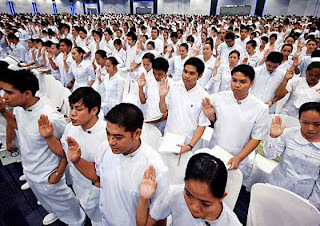 Nursing Board Exam Result is expected after a month from the date of exam. Below is the partial list for June 30-July 1 Nursing Board Examination. 1ABABAO JAN CHRISTIAN TATLONGHARI NEW ENGLAND COLL. 2 ABABAO MICHELLE ANN CABAGNOT FEU-NRMF-Q. C.
6 ABACO ELY JANE CAMACHO SO.EAST ASIAN COL.
7 ABAD AARON JAY LABUCAY DR.C.S. LANTING COLL.-Q.C. 9 ABAD ALQUEZA ESTEBAN NORZAGARAY COLL. 16 ABAD JHOANNE CERAME UNION CHRISTIAN COL.
17 ABAD JONATHAN AUGUST LAXAMANA SO.EAST ASIAN COL.
19 ABAD JOSELYN MARIE VALDEZ SAN JUAN DE DIOS EDUC.FDTN.,INC. 9 ABAD NURAENA ABBAS ST.LOUIS UNIV. 14 ABADIR JOHN LYNDEL SANCHEZ SO.EAST ASIAN COL.
16 ABAGAN ELVIES LENGOYNA P.L.T. COLL. 3 ABALOS MA. KRISTINE GARCIA SOUTHVILLE I.S.C. 6 ABALOYAN VERNA LOU ORTEGA J.P.SIOSON COLL.,INC. 13 ABANES BERNADINE CORPUZ GLOBAL CITY I.C. 14 ABANES ISAIAH MACABALITAO FEU-NRMF-Q. C.
21 ABARABAR ANDREI PRADO SO.EAST ASIAN COL.
6 ABARQUEZ MARY GRACE RAMOS J.RIZAL UNIV. 8 ABARRA JERNIE ANN NANGKIL DR.C.S. LANTING COLL.-Q.C. 12 ABARRO MARICAR QUILON MANILA DOCTORS COLL. 13 ABARY JOSHUA PANTALEON TOMAS CLAUDIO MEM. 12 ABCEDE LEA DIANE ARCEO MANILA DOCTORS COLL. 22 ABDUL RYAN HISANAN J.RIZAL UNIV. 1 ABDULGANI NORALEA MAUNA SMD FNDTN. ACA. 3 ABDULKARIM SENAIDA DONGALLO FEU-NRMF-Q. C.
17 ABEJERO SHERWIN DE JUAN DR.C.S. LANTING COLL.-Q.C. 19 ABELA ERICK INFANTE RIVERSIDE COLL. 6 ABELLA JOHANNA MARIE BACOLOD MANILA DOCTORS COLL. 13 ABELLANA MIKHAELA KRISTINA SEVIDAL MANILA DOCTORS COLL. 16 ABELLERA JOSE WILLIE III CONIO PANPACIFIC U.N.P. 17 ABELLERA PATRICIA BIANCA STA ANA U.E.R.M.M.M.C. 19 ABELLO FLORABEL CAÑETE NUEVA ECIJA COLL. 3 ABENA SHEILA MARIE QUIRANTE P.COL. HEALTH & SCI. 4 ABENOJAR BEA ABONG FEU-NRMF-Q. C.
9 ABERIN NENITA MORIDAS DR.C.S. LANTING COLL.-Q.C. 11 ABES MARY JANE CLOSA DE OCAMPO MEM. COL.
16 ABIDIN ALFAHDZLY JAUJANI LIPA CITY COLL. 18 ABIERON MADZMER JAJI SULU STATE COLL. 21 ABINALES JEROME ALICHA FEU-NRMF-Q. C.
4 ABIOG RONALD JAVIER DR.C.S. LANTING COLL.-Q.C. 8 ABLAO FRANCES ANN NAPEÑAS DE OCAMPO MEM. COL.
12 ABLOG ARRON PAUL BUENAVISTA MANILA DOCTORS COLL. 16 ABOGA MIRASOL DAZO U.E.R.M.M.M.C. 19 ABONG ARLYN LAURENTE RIVERSIDE COLL. 3 ABORRO ANNA RIKKA CASAS SO.EAST ASIAN COL.
6 ABOY PRINCESS BATAAN J.RIZAL UNIV. 9 ABRAHAM RAYMOND MENDOZA J.RIZAL UNIV. 14 ABRERA JOHN KENNETH PANGANGAAN J.RIZAL UNIV. 5 ABU ANGELICA JAY BULUSAN P.COL. HEALTH & SCI. 10 ABUAN KATHY BOBITA J.RIZAL UNIV. 2 ABULENCIA MARJOHN VILLANUEVA J.RIZAL UNIV. 5 ABUNALES VALENTINA MONTES ST.DOMINIC SAVIO COLL. 10 ABURAYYAN NOUR PAGULAYAN SOUTHVILLE I.S.C. 11 ABUSO JEAN MYRA ASIS J.RIZAL UNIV. 14 ABUTOG KATRINA CORAZON ESPINOSA OL GUADALUPE COLL. 20 ACAS SITTIE MARIAM SALINA ILIGAN MED. CTR. COLL. 2 ACDAL STRAWBERRY BERGANOS MANILA DOCTORS COLL. 9 ACEDERA JOHN PAUL PINCA EASTERN VISAYAS C.C. 10 ACEDO KESSELYN CAMALIG SO.EAST ASIAN COL.
20 ACHARON RICHARD DEAN VILLANUEVA SO.EAST ASIAN COL.
21 ACHIVARA DEMI LYNN SANCHEZ PANPACIFIC U.N.P. 1 ACIBAR VERGEL GEDRAGA OL GUADALUPE COLL. 5 ACLAN CARLA ANGELA CASTICIMO SO.EAST ASIAN COL.
6 ACLAN JERICHO BYRON ORDANOZO MANILA DOCTORS COLL. 10 ACOB LOVELY SALAGUINTO WEST BAY COLL. 11 ACOB REGIE NACNAC NORTHWESTERN UNIV. 12 ACOBA MA GEMMA LASQUETY CALAYAN EDUCATIONAL FNDTN. 14 ACON PRECIOUS ALILY TOLENTINO T. DEL ROSARIO ACAD. 13 ACOSTA MARY GRACE ASPACIO U.E.R.M.M.M.C. 22 ACUIN ERICSON FATALLO J.RIZAL UNIV. 3 ACUÑA ARLA MARGARITA SILVESTRE SAN PABLO COLL. 6 ACUÑA MARIA ANGELICA DURAN FEU-NRMF-Q. C.
Buzz online is created when American Reporter announced that Season 11 'Idol runner-up Jessica Sanchez will join Season 4 of the world's hit tv show, Glee. Talk between Sanchez camp and Glee producer is ongoing for another major episode for the talented and most talk-about Fil-Mexican singer. According to TV Line, Jessica Sanchez will join the cast midway through the season and will have a recurring role. She will be joining with the high profile Sarah Jessica Parker and Kate Hudson, who have both signed on for multiple episodes. From reports, Jessica need to finish first her Idol Tour before concentrating on Glee. Jessica will have to perform in Manila on September 21, the last stop of the American Idol Summer Live Tour. On Sept. 13, 2012 is FOX's Glee premier as confirmed. It is sure that you are excited for Jessica's appearance on Glee Season 4. Tell us what you want to be her role on her journey with the cast of Glee. Forbes Magazine released the 2012 top 40 richest Filipino individual or business tycoons in the Philippines. 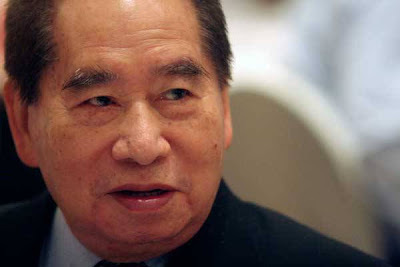 Henry Sy is still the undisputed highest in terms of shares and other financial records with $9.1 Billion. MVP is still not included in the list although he already acquired majority of telecommunications and businesses in the country. The list was compiled using shareholding information and financial data obtained from the Philippine Securities and Exchange Commission, the Philippine Stock Exchange, analysts or the companies themselves. Privately held companies were valued based on comparisons to prevailing price-to-earnings or price-to-sales ratios for similar publicly traded companies. Net worths were calculated using stock prices and exchange rates. Largest Retailer in the Philippines, SM Prime Holdings. 2. Lucio Tan - with $4.5 billion. Married. 6 children. Owner of Philippine Airlines,Conrols Eton Properties Philippines, Philippine National Bank, Fortune Tobacco, Asia Brewery, Tanduay Holdings, Allied Bank, University of the East and more. 6. Andrew Tan - $2.3 billion. Married. 4 children. Runs Alliance Global Group Inc, Megaworld Corporation, Emperador Distillers Incorporation and Golden Arches Development Corporation. 7. Jaime Augusto Zobel de Ayala and family- with $2.2 billion . Married. 7 children. President and chairman of Ayala Corporation. Currently, his son, Fernando Zobel, is president of the corporation and his eldest son, Jaime Augusto Zobel de Ayala II, holds chairman and CEO. 10. Eduardo Cojuangco- with $1.4 billion . Married. 4 children.San Miguel Corporation CEO. 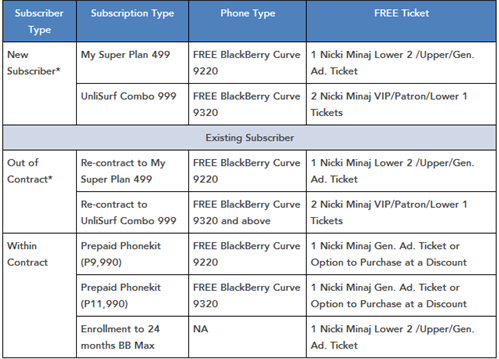 Globe in partnership with Reasearch in Motion(RIM), the company behind mobile phone brand Blackberry will bring a majestic one-night only concert show of the popular Super Bass girl Nicki Minaj at the SM Mall of Asia Arena on July 11, 2012. According to Globe, this is an exclusive event to new postpaid subscribers who will avail of the Blackberry bundles. Pink Friday Tour of Nicki Minaj will play in over 50 shows in Europe, Asia, Australia and North America. According to a reliable source, it will be the only Southeast Asian stop of the world tour, thanks to Globe and RIM. According to Cameron Vernest, RIM country director, Minaj, just like a growing number of Filipinos, has been a proud BlackBerry user for years. “The promotion gives everyone the chance not only to see Minaj perform her hits ‘live,’ but to also experience how it’s like to be hyper-connected via Blackberry,” he explained. Nicki is a Trinidadian-born American rapper and singer-songwriter that quickly became a global phenomenon shortly after releasing her debut album Pink Friday last November 2010. It became an instant hit, peaking at no. 1 on the US Billboard 200 and being certified Platinum by the Recording Industry Association of America (RIAA) only a month after its release. How to Get FREE and EXCLUSIVE ACCESS to the NICKI MINAJ PINK FRIDAY TOUR Live in Manila? The Idol fever is still high for the Filipinos as Ovation Productions will bring the Season 11 finalists of Americn Idol. Jessica Sanchez, Pinoy's pride and runner -up is confirmed part of the much- awaited American Idol Tour. The event is scheduled on September 21 at the Smart Aranet Coliseum. Jessica will be with other Season 11 finalists, however, it is uncertain if American Idol Season 11 champion Phillip Phillips could come with the tour. According to report, he is still recovering from a kidney surgery. Recovery was said to take long for six months. Ovation Productions also brings the American Idol Season 10 LIVE tour in Manila last year which featured Filipino-American finalist Thia Megia. It was the only show of the group outside America. Page will be updated soon to know more about ticket prices, promos and announcements. Professional Regulation Commission just posted recently the room assignment for June 2012 Environmental Planner Licensure Examination (EPLE). Board exam date is on June 20 and 21, 2012. Results of board exam is expected after two days or by June 23, 2012. Examination venue is in Manila only. 2 ADA ARLYN MENDEZ DIVINE WORD UNIV. 9 ANSELMO ORLANDO GANIO C.L.S.U. 24 CAYTON JACKY-LYN SANTOS MIRIAM COLL. 35 DIZON RAYMUND MARQUEZ UNIV.OF THE ASSUMP. 41 GARAY JOSE MERLITO SALAMANES U.N.E.P. 49 LEONG ROANNE SIMBULAN MIRIAM COLL. 53 MACAGBA SHARON FELIZA ANN PALMA FOREIGN UNIV. 57 MARALIT RONIE AMADO GARCIA C. C. P.
61 MILLARES RODRIGO JR PANOLIN SILLIMAN UNIV. 66 NIDUAZA MARLON ALVAREZ ST.LOUIS UNIV. 67 NIERRAS MARIVIC JADULCO DIVINE WORD UNIV. 76 PINEDA WINSTON PATACSIL ST.LOUIS UNIV. 89 SANTOS RACHELLE SALAC HOLY ANGEL UNIV. 109 VENTURILLO REAGAN MANLAVI WESTERN PHILS.UNIV. 112 VILLARETE NIGEL PAUL CALO CEBU INST. OF TECH. Facebook is still the most searched website worldwide according to the reliable Google Insights for Search. Inspite the launch of Google Inc.-owned social networking site Google+ (G+) last June 28, 2011, Facebook is strong with 900 Million active users as of May 2012. On the other hand, Google+ is on the catch with only 170 Million registered users. Google Insight for Search Top Searches for 2012 includes Youtube at no. 2 position followed by Google and Yahoo respectively. Worldwide search interest also includes games, weather, news and Amazon on the top of the list. Comparison of the social networking sites using Google Trends shows that Facebook really owns hot searches and strong at almost 100% worldwide leaving a little percentage to Twitter and Google+. 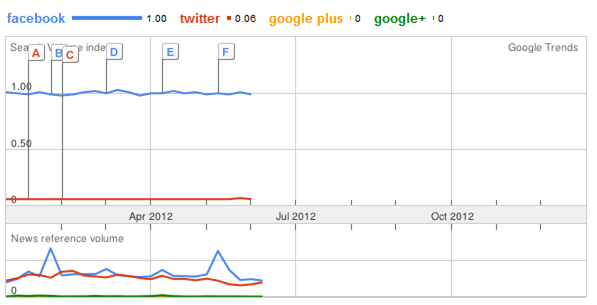 However, news reference shows a battle between Twitter and Facebook. Twitter is an online social networking service and microblogging service that enables its users to send and read text-based posts of up to 140 characters. It is known as "tweets". It was created in March 2006 by Jack Dorsey. . Aside from Facebook,the service rapidly gained worldwide popularity with over 140 million active users as of 2012, generating over 340 million tweets daily. Nursing Licensure Examination (NLE) is the hottest board exam event for the Professional Regulation Commission (PRC). Nursing board exam is very challenging on their part since the total numbers of examinees is higher compare with other profession's board exam. At the end of this month, June 30 until July 1 2012, examination is scheduled at different testing centers in the country, Manila, all Regional Offices, Zamboanga, Angeles, Cabanatuan, Dagupan and Laoag City. Board exam results is expected a month or so considering high numbers of total examinees. Please subscribe at my page thru e-mail or RSS. Don't forget to LIKE us on Facebook for the up-to-date result of board exam. Last May 18, 2012, the final run of Online Application System or OSA became successful. This served as a good tool for PRC to minimize and simplify work on their part and on the examinees. The Philippine Nursing Board Exam is a multiple choice 500-items test for the basic competency of our nurses. 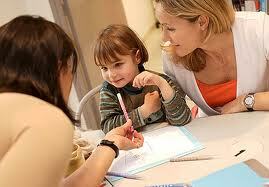 Broad areas of nursing are also included as well as other related competencies. It is held every June and December annually in different public schools around the Philippines. Room assignment for the exams are posted outside the Professional Regulation Commission building at least three days before the exam. 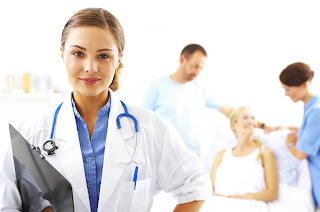 There are certain policies that should be considered before applying for the nurse board exam. Be a citizen of the Philippines, or a citizen or a subject of a country which permits Filipino nurses to practice within its territorial limits on the same basis of the subject or citizen of such country, provided that the requirements for the registration or licensing or nurses in said country are substantially the same as those prescribed in this RA 9173. 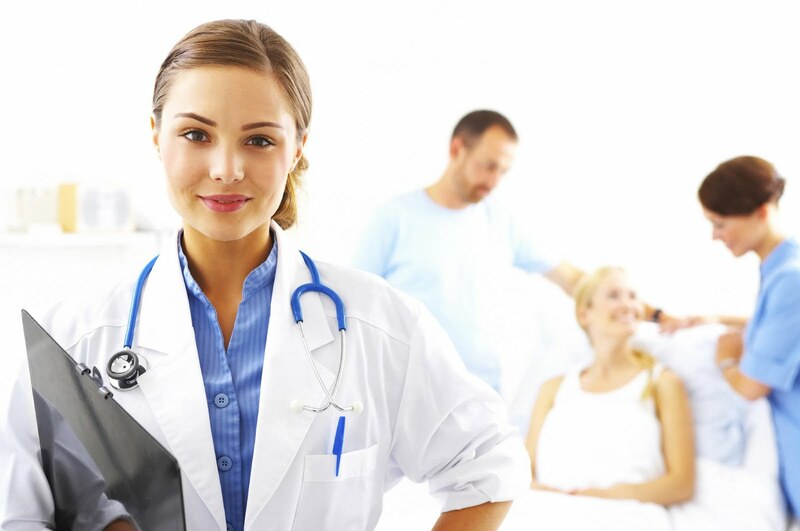 Holder of a Bachelor's Degree in Nursing from a college or university that complies with the standards of nursing education duly recognized by the proper government agency. December 2011 board exam result was released after more than 2 months.There was a total of 22,760 out of 67,095 passed the examination or almost 24% passing rate. Jerald Lalaguna Pelayo from Mountain View College topped the board exam with 86.40%. It was followed by Linsid Angelou Absin Tapongot from Xavier University (XU) with 86% grade. Meanwhile, it was SAINT PAUL UNIVERSITY-ILOILO that was hailed for the top performing school with 100% passing rate. July 2011 Nursing Board Exam was released after a month. There was a total of 37,513 out of 78,135 passed the Nurse Licensure Examination.JOMEL GARCIA LAPIDES from University of the Philippines-Manila got the top spot with 88.40% rating. It was followed by HAZEL CORTES CRISOSTOMO and BEVERLY LYNNE YAO both from UST. Last June 2006 board examination, there was a complaint from 92 examinees led by Rachelle Cyndi Ong Erfe, a graduate of Saint Louis University (SLU) in Baguio City, alleging leakage of questions in two sections of the nursing board examination. The complainants asked the Professional Regulation Commission to nullify the affected sections to preserve the integrity of the licensure examination. The Professional Regulation Commission (PRC) eventually reversed its earlier pronouncements that there was no cheating when it announced that two BoN members leaked questions. According to one of the two members who were removed for “negligence,” she just inadvertently left copies in a Photocopy shop near the PRC-Manila office where she was photocopying her 500 questions. Others charged that the BoN members were bribed by the review centers to provide them with copies of their questions and answers. U.S. based media coverage of this scandal was sparse and little follow-up occurred. The test scandal was covered in depth in at least one nursing magazine, the article "A Breach of Integrity" by Geneviève M. Clavreul, RN. Ph.D. was published in November 2006. BENJAMIN PENASO CASONO from UPD got the top spot for the June 2012 Architecture Licensure Examination with 83.80% rating. It was followed by ALEXIS KEN SOSMEÑA CARTAJENAS of the same school with closed grade of 83.50%. University of San Carlos(USC) is the only top performing School listed by PRC for June 2012 ALE. Total no. of examinees who passed is 42 out of 50 or 84% passing percentage.